1. For the pudding, lightly grease a 1.1 litre basin and line the base with a disc of baking parchment. Put the dried fruit and peel in a bowl and pour over the armagnac; set aside for a few hours to soak. 2. Using electric beaters, beat the butter, muscovado sugar and clementine zest in a bowl until light and fluffy – about 5 minutes. Add the eggs one at a time, beating well between each. In another bowl, mix together the flour, cocoa, spices, breadcrumbs and almonds, then add to the mixture, along with the soaked dried fruit, chocolate, apple and clementine juice. Mix with a wooden spoon until combined. 3. Scrape the mixture into the pudding basin and level. Put a sheet of baking parchment on top of a sheet of foil and fold a pleat in the middle. Place foil-side up on top of the pudding and fold the excess down over the sides of the basin. Tie with string to secure in place, and cut off any excess foil/parchment. 4. Fill a large saucepan halfway with water and place an upturned saucer on the bottom. Bring the water to the boil and put the pudding on top of the saucer. Reduce the temperature to a simmer, then cover and steam for 3 hours 30 minutes. Check every so often; top up with water if needed. 5. While the pudding is steaming, make the candied clementines. Preheat the oven to 100°C, gas mark ¼. Put the sugar and 200ml water in a saucepan and bring to the boil. Add the clementine slices, then reduce the heat to a gentle simmer. Cook until the fruit looks translucent – about 2 hours. Carefully lift the slices from the syrup and place on a parchment-lined baking tray. Bake for about 45-60 minutes or until they’re a little less wet (just slightly tacky). Set aside until needed. 6. Carefully lift the pudding from the pan and uncover. Invert onto a plate and set aside. For the sauce, put the chocolate and cream in a small pan and stir together over a low heat until smooth. 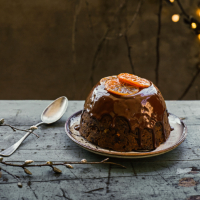 Pour over the pudding and decorate with a few of the clementine slices (the rest can be left to dry overnight and then kept in a sealed container for up to 2 weeks).